Live in anticipation, gathering stories and memories. New research builds on the vogue mantra of behavioral economics. For Killingsworth, happiness is in the content of moment-to-moment experiences. Nothing material is intrinsically valuable, except in whatever promise of happiness it carries. Satisfaction in owning a thing does not have to come during the moment it’s acquired, of course. It can come as anticipation or nostalgic longing. Overall, though, the achievement of the human brain to contemplate events past and future at great, tedious length has, these psychologists believe, come at the expense of happiness. Minds tend to wander to dark, not whimsical, places.Unless that mind has something exciting to anticipate or sweet to remember. Over the past decade, an abundance of psychology research has shown that experiences bring people more happiness than do possessions. The idea that experiential purchases are more satisfying than material purchases has long been the domain of Cornell psychology professor Thomas Gilovich. Since 2003, he has been trying to figure out exactly how and why experiential purchases are so much better than material purchases. 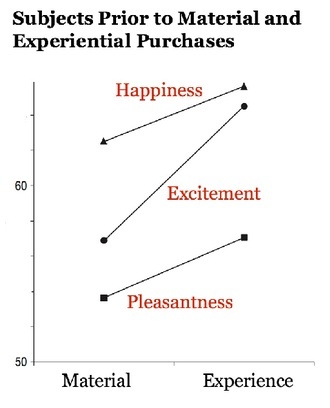 In the journal Psychological Sciencelast month, Gilovich and Killingsworth, along with Cornell doctoral candidateAmit Kumar, expanded on the current understanding that spending money on experiences “provide[s] more enduring happiness.” They looked specifically at anticipation as a driver of that happiness; whether the benefit of spending money on an experience accrues before the purchase has been made, in addition to after. And, yes, it does. Essentially, when you can’t live in a moment, they say, it’s best to live in anticipation of an experience. Experiential purchases like trips, concerts, movies, et cetera, tend to trump material purchases because the utility of buying anything really starts accruing before you buy it. Gilovich’s prior work has shown that experiences tend to make people happier because they are less likely to measure the value of their experiences by comparing them to those of others. For example, Gilbert and company note in their new paper, many people are unsure if they would rather have a high salary that is lower than that of their peers, or a lower salary that is higher than that of their peers. With an experiential good like vacation, that dilemma doesn’t hold. Would you rather have two weeks of vacation when your peers only get one? Or four weeks when your peers get eight? People choose four weeks with little hesitation.